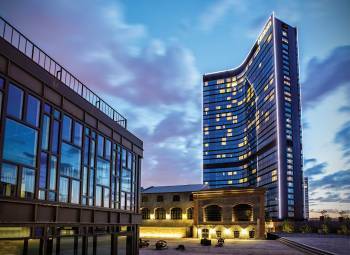 Enjoy contemporary luxury at the Hilton Istanbul Bomonti Hotel & Conference Center, the largest of its kind in the city. Located in the central area of Sisli, adjacent to the former Bomonti Beer Factory, this impressive, 34-story hotel offers easy access to many Istanbul attractions, historical buildings, shopping malls and neighboring business districts.Unwind in an elegant, air-conditioned guest room at this Istanbul hotel with a range of amenities, including ergonomic work areas, WiFi (fee applies) and floor-to-ceiling windows. Upgrade to an executive room or suite for exclusive Executive Lounge access. With a wealth of flexible meeting spaces, including a grand ballroom with a capacity of 3,200, this stunning hotel is perfect for business meetings and glamorous celebrations in Istanbul. A 24-hour business center offering a range of services and amenities, and a professional staff are available to help ensure a truly unforgettable event.Enjoy breathtaking Bosphorus and city views from the rooftop bar, located on the 34th floor of the hotel, and dine in style in our all-day dining restaurant. Maintain your fitness regimen with the very latest exercise equipment in the modern, 24-hour fitness center. Soothe tired muscles in the Turkish bath or treat yourself to a luxurious massage in the expansive eforea: spa at Hilton. Cool down in the indoor or outdoor swimming pools or unwind with a drink at the pool bar as you soak up the Turkish sunshine. Whether your are hosting an intimate meeting ot a lareg conference, Hilton Istanbul Bomonti Hotel & Conference Center offers the space, location and facilities to make it a memorable success. Make the most of 12.000sqm of event space and select from more than 30 meeting rooms, stylish and pillar free Grand Ballroom with 9m ceiling height or Crystal Ballroom flooded with natural daylight. Whatever your requirements, our Meeting Organizers are on with dedicated support every step of the way with meticulous attention to every detail to ensure unforgettable events. Come and experience style and service taken to new heights!